PRICE REDUCED - Make an offer - will trade for real estate (LOCATION: Sunny Isles FL) The Ocean 63 Super Sport is a big, brawny, fishing machine with aggressive styling, outstanding accommodations, and exceptional performance. 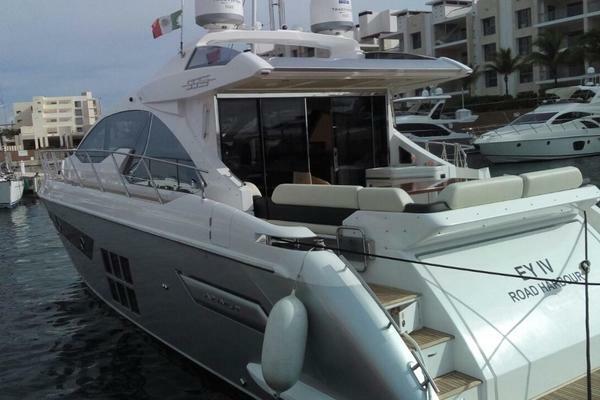 This is a four stateroom 63 SS with roomy flybridge and versatile cockpit. Interested fishing, diving, or cruising? This sportfisherman is ready to accommodate. The flybridge features hardtop, centerline helm station, twin helm chairs, and guest seating. The helm features a full complement of electronics including: radar, GPS, autopilot, fishfinder, compass, and VHF radio with hailer. The bridge is equipped with outriggers, rocket launchers, and spreader lights. The large cockpit gives you more than enough workspace, and includes prep station with sink, livewell, tackle locker, fish boxes, fighting chair, transom door, saltwater wash down, and a cockpit freezer for all your catch. The foredeck includes stainless steel bow rail, cushioned seating, and bow pulpit with anchor and windlass. The interior is large, open, and comfortable. There's lots of room to relax after a day of fishing and discuss the ones that got away while enjoying a cold beverage. The carpeted salon has an L-shaped settee with drop-leaf adjustable table, two easy chair, and entertainment center with TV. Opposite the entertainment center is a breakfast bar overlooking the galley below. Forward is a full galley with premium refrigerator/freezer, range with oven, microwave oven, dishwasher, upper and lower cabinets with lots of storage, and a solid surface countertop with stainless steel sink. A starboard companionway leads down to the staterooms. For overnight and extended fishing trips there are four staterooms. The VIP stateroom is forward with island queen berth, two hanging lockers, bulkhead storage, accent lighting and ensuite head compartment. The master stateroom is amidships with island queen berth, two hanging lockers, bulkhead storage, mirrored vanity with accent lighting and ensuite head compartment.The two guest staterooms have twin berths, under-berth storage, and hanging locker, The guest/day head has mirrored vanity, and shower. Lots of room and first class accommodations makes the fishing and cruising all the more enjoyable. Performance is provided by twin MAN 12 cylinder engines generating 1200 horsepower. Mechanical features include: two generators, reverse cycle HVAC, water heater, central vacuum, washer/dryer, and engine room fire suppression. She is a good-looking, well-equipped sport fisherman with tons of room. If you are serious about fishing in style or looking for a family-friendly cruiser call now for more information and to schedule a showing of this 63' Ocean Super Sport. United Yacht Sales New Jersey would love to guide you through a personal showing of this 63' Ocean Yachts 63 Super Sport 1990. This yacht for sale is located in Sunny Isles, Florida and priced at $239,000. For a showing please contact us by filling out the form on this page and we will get back to you shortly!